If just hearing the word “vegan” intimidates you, Ethos Vegan Kitchen can provide the exposure therapy you need to help you conquer your fear. and Laina is a seasoned businesswoman with a background in hospitality and a penchant for baking. The couple designed Ethos to be a truly ethical restaurant down to its core. The establishment sources fair trade foods, ensures that no sweatshop labor is used in the making of the employee uniforms, uses sustainable produce, offers biodegradable takeout boxes, minimizes the use of disposable utensils and uses LED bulbs in the restaurant lighting. A warm, inviting family-friendly space decorated with eclectic art from local Orlando artists and household names like Jean-Michel Basquiat, Ethos could almost be mistaken for a local diner. Complete with booths and a seemingly endless L-shaped bar, the unpretentious eatery makes vegan seem quite approachable. But, if you’re seeking vegan eats for the health benefits, look elsewhere. You won’t find a menu peppered with kale-based dishes, salads, juices, kombucha, acai bowls and other earthy-sounding options at Ethos. Instead, you’ll be welcomed by jazz pouring over the radio and familiar dishes; plant-based takes on traditional comfort food. Calzones, lasagnas, Philly cheesesteaks, macaroni and cheese…the menu is hardly exotic. What distinguishes the eatery is how much everything fools you. My omnivorous parents fell instantly in love when I first took them, even though they are usually skeptical of vegan cuisine. For non-vegans looking to get a taste of this trendy, ethical diet, Ethos is the place to test the waters. And don’t worry about not fitting in. 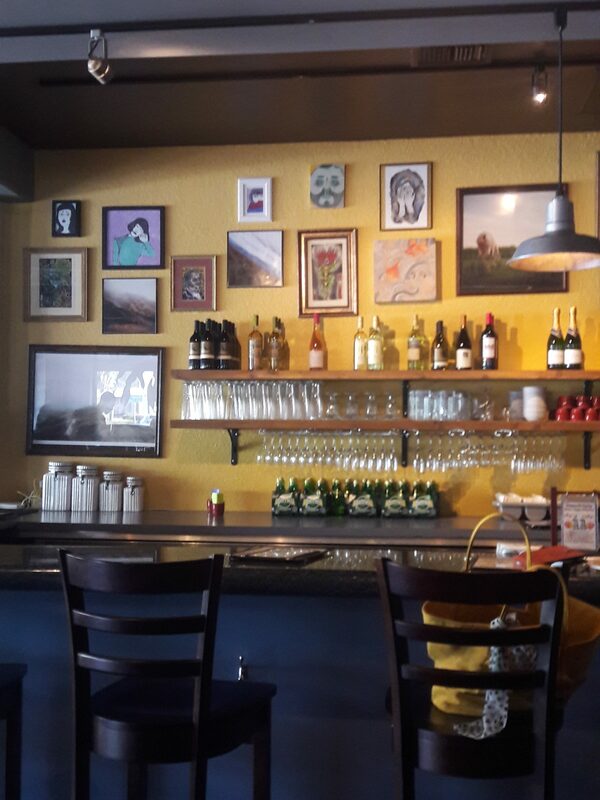 The clientele is as diverse as the artwork on the walls, so if you don’t fit the vegan hipster profile, you won’t be alone. The front porch is often teeming with waiting families and couples young and old. I have never found the place empty, and once you try it, you’ll understand why. The build-your-own calzone is by far my favorite entree. The warm, crispy, hearty crust that encases your choice of veggies and other fillings, along with tofu doing a spot-on impression of ricotta cheese, is heavy enough that I have yet to polish one off all in one go. 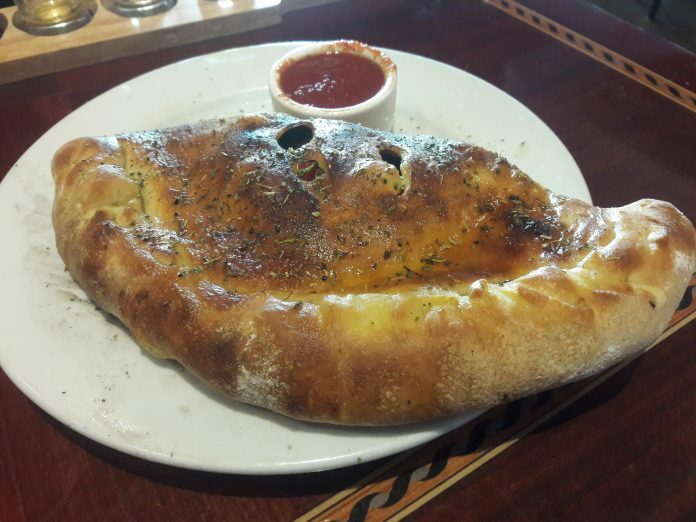 If you’re toying with the idea of veganism but terrified to take the plunge because gasp how will you live without cheese, let the calzone make its case for why you won’t be missing out. The can’t-miss menu item is no doubt the garlic knots appetizer. Warm, doughy and crispy in all the right places and served with butter-like dipping oil, these knots will become one of the many reasons you are drawn back to Ethos. The exceptional service is on par with the food in terms of quality. At my latest visit, three different waitstaff checked in on my friend and I, and in previous visits, the employees have always been warm, welcoming, and quick to offer kind compliments and recommendations. If vegan food seems like a foreign land, coming to Ethos will be like stopping in a McDonald’s in another country. There’s no question why they have been named Best Vegetarian Food in Orlando by several publications for years in a row. And as a cherry on top of this metaphorical nondairy sundae (they do serve real ones at Ethos, by the way), the menu prices completely shut down the myth that “vegan” translates to “expensive.” I usually walk out of there having spent only around $10-$15. If you’re in the Winter Park area, do not skip Ethos. Your taste buds and the planet will thank you. Kristen Pizzo is a freelance writer and a senior studying Writing and Rhetoric at the University of Central Florida. She is always on the hunt for the best coffee shops and vegan eats in Orlando. Her work can be found at https://pizzokristen.wixsite.com/writingportfolio. She also writes down her thoughts on food, love, and issues she cares about on Medium at https://medium.com/@pizzokristen.